Romitaman Original Comic Book Art :: Private Collection :: Amazing Spider-Man Annual #6 Preliminary Cover SOLD SOLD SOLD! by artist John Romita Sr.
Click Here To See Amazing Spider-Man Annual #6 Comic Book! 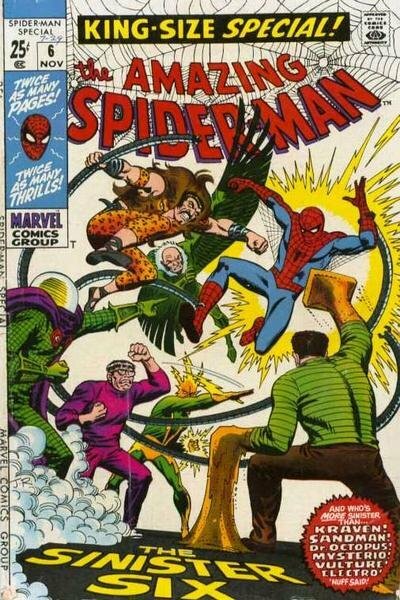 Check out this very cool 1969 The Amazing Spider-Man Annual #6 FULL SIZE Preliminary Cover, which was drawn entirely by the great John Romita Sr, from the story titled: "The Sinister Six!" This nice cover features John Romita drawing "HIS VERSION" Of Steve Ditko's Amazing Spider-Man Annual #1 just 6 years later in 1969! Spider-Man [Peter Parker] battles The Sinister Six: [Sandman [Flint Marko]; Kraven [Sergei Kravinoff]; Dr. Octopus [Otto Octavius]; Mysterio [Quentin Beck]; Vulture [Adrian Toomes]; and Electro [Max Dillon]]! 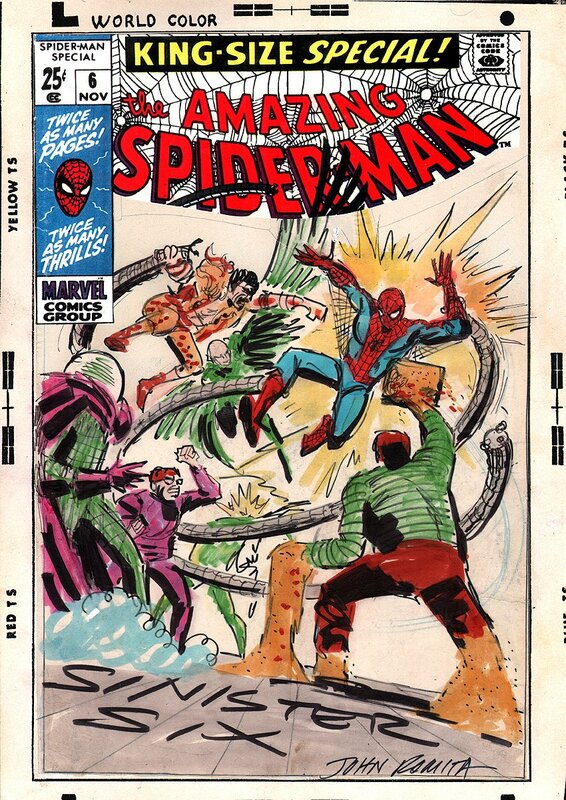 John Romita back in the 1960's (Like Gil Kane) would draw his cover art on vellum first, in marker to make sure he had the right size and spacing for his final version cover he would draw right after, at the same exact size as the published cover! What a treat here to see the thoughts that went into one of the comic book artist GREATS, and how he prepared his cover schemes and set ups, not to mention, John Romita even deciding his COLOR schemes for the cover as well! Just a great way to get a piece of 1960's John Romita Cover art without spending an arm and a leg! Art is signed at the bottom by the great John Romita also! Compare this nice cover art to the published comic book in the red link above! ALL HIGH end pieces of art, including this one, are able to be purchased with VERY fair time payment plan options, and trades are always considered towards this and any other pieces of art on my site here! Just send me an email and we can try to work something out.